In recent weeks, the kiss-kiss, hug-hug relations between Manila and Beijing officials have ever so slightly cooled. The reason – summer has brought several hundred Chinese fishing boats around Pag-Asa island, just as the Philippine military is about to do a major facelift of its facilities there, including the air strip and airport. The summer winds blowing through Malacañang Palace seem to have also inspired officials to sing a different tune about the South China Sea. This afternoon, presidential spokesman Salvador Panelo held for the first time a “virtual presser” for reporters from the foreign media. I would not have known about it had not not my editors assigned me to it. Do you know that nearly three years after assuming the presidency, President Rodrigo Duterte has yet to deliver a major policy speech before the foreign media, including the Foreign Correspondents Association of the Philippines? Neither has his foreign secretaries ever met FOCAP. I’m just glad that Malacanang has started opening up to the foreign media. A military exercise in which US and Philippine forces simulate repelling a foreign power that has seized control of a Manila-controlled island in the South China Sea is not meant to send a message to China, presidential spokesman Salvador Panelo insisted on Monday. Responding to a question by the South China Morning Post, Panelo was adamant that the Balikatan 2019 naval drills, which took place from April 1 to 12, were “regular military exercises jointly agreed upon by the two countries even prior to the so-called present conflict between China and the Philippines”. So, there’s nothing new, there’s nothing new in that,” he said during the Malacanang Palace’s first virtual press conference with foreign media. While both the US and the Philippines have claimed the exercise is not aimed at China, some of the activities it has involved have prompted scepticism of those claims. Since January, Manila and Beijing have been at loggerheads over China’s deployment of a large fleet of vessels to the Philippines-held Thitu island in the South China Sea. Beijing has sent a fleet of about 275 boats to the vicinity of the island, in what analysts have claimed is an effort to dissuade Manila from constructing military facilities there. Beijing is concerned the United States would be able to use the facilities, according to diplomatic observers. The presence of the Chinese vessels recently prompted Philippine President Rodrigo Duterte, using the Philippine name for the island, to warn Beijing to “lay off Pagasa because I have soldiers there”. “If you touch it, that’s a different story. I will tell the soldiers ‘prepare for suicide mission’,” Duterte said. But despite the ongoing tension, Panelo insisted that the Balikatan exercises were a separate issue, adding that relations with China were “still friendly, cordial, while we are asserting our rights over [the island], we maintain our friendly relations”. Panelo also said the Philippines had a “neutral stance” on America’s assertion of freedom of navigation and overflights in the South China Sea. To read the rest, please click on this link. Today, it is Sunday, April 21, 2019. A day of celebration that Christ our God-Man resurrected after 3 days in death.- Hole-luyah to us celebrants!
. . . The counterintelligence investigation is not necessarily complete, but from the glimpses we see in the Mueller report, it should set off very serious national security alarm bells. What about in the Philippine scenario? Do we have such a national security alarm bells to be concerned about – a security nightmare? I agree with the writer in this blog that here there is: the kiss-kiss, hug-hug relations between Manila and Beijing officials have ever so slightly cooled. Our scenario is not actually the same with the USA but there is is this common thing, our national security. Is it a nightmare? To answer it consider the following below. 1.) PH is not banking on the decision of the International Court of Arbitration. 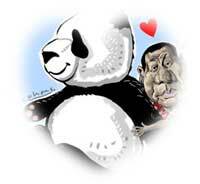 It is a ‘ kiss-kiss, hug-hug relations between Manila and Beijing officials’. 2,) PH is not ready to stand-up to Beijing. The latter has indeed threatened war to PH if resistance is made at the West PH Sea, etc. 3.) PH ‘loves’ Beijing and its Xi Jinping to the extent that ‘jokingly’ we maybe a part province of China. Clap clap clap with Kiss-kiss, hug-hug and bang-bang. 4.) PH is with Beijing ‘have ever so slightly cooled’ now so far as election next month is coming. 5.) PH now allows more Beijing nationals to come over here and work in many sectors of the country. It is ever so open now for it into many thousands. 6.) PH is now so cool with Beijing that there is no need to be alert about anything including our national security and whatever else it be. The fight against illegal drugs continues but its sources PH does not really know from where. 7.) Contracts for national projects here is ever so open to Beijing in many instances, whether favorable or otherwise to PH interest. And defended in favor of Beijing together with PH. 8.) PH territories are taken over, occupied and build build & build by Beijing into so many forms like garrisons, airports, scientific purposes and even catching all the fish and clams from it with much ado to the extent of driving away PH fishermen in those areas by Beijing gun boats and warships.. 9.) PH to ‘kiss-kiss, hug-hug relations between Manila and Beijing officials have ever so slightly cool’ continues as election time is coming. 10.) Election time this May is coming. Hugpong pag Babago candidates – vote for them is moving forward all over the country-wide. Are our alarm bells ringing? About PH national security concerns? Does PH need a counterintelligence investigation like in the land now in USA? What do Filipinos say? But first, does our voters have intelligence? What counter can PH have with intelligence? Hole-luyah again Pilipinas! Christ is risen. Enjoy the weekend. Duterte was overruled by Lorenzana. Sabi niya dati, wala nang Balikatan exercise. today is good friday. may almighty headache ako! must be the crown of thorns I’m looking at. lorenzana overruling digong? not if his -ten reaches his pusod, he, he, he. lorenzana can only swim in the lagoon he is permitted to swim, north, south, east, and west, he can swim, how deeply, or shallowly? it’s up to him, but never is he allowed to swim outside the lagoon. trying to appease opposition voters lang yata si lorenzana and following order from the crazy one. gotta continue time honored balikatan exercises, election is hovering kasi. gotta pacify opposition voters and convert some of them to vote for digong’s candidates. so soon after balikatan exercise, digong will be sending our armed forces to attend china’s military parade? review?, going full speed ahead to pay homage to china, attending the parade of nations hoodwinked by the promises of one belt, one road and ultimately, debt traps and bad loans, he, he, he. bet our armed forces will be served scrumptious food taken from our seas. I wish them stomachache and dayareya as well! forgive me my bad thoughts, my lord. And the Lord said, all is forgiven. The ANSWER is: Philippines has the strongest claim of Spratly since it is geographically part of the Philippine archipelago and it’s just 100 kilometers away from Palawan Island. It means that it is much closer to the Philippines than any other countries. According to 1982 United Nations Convention on the Law of the Sea (UNCLOS), the Spratly Islands lie within the Philippines’ 200-mile Exclusive Economic Zone. If China deceitfully and only lately created its 9-dash line, Philippines has more than that – it has A 200-MILE-DOT-LINE bigger than the 9s-line a long time ago before the Qin Dynasty empire existed! The Permanent Court of Arbitration in the PH case vs China, said: The line, first inscribed on a Chinese map in 1947, had “no legal basis” for maritime claims, deemed the Permanent Court of Arbitration in the Hague. The news from that Court reported that: First the dotted line on Chinese maps lost two of its hyphens in 1952, when, in a moment of socialist bonhomie with Vietnam, Chairman Mao Zedong abandoned Chinese claims to the Gulf of Tonkin. Then, on July 12, 2016, an international tribunal ruled that the now nine-dash demarcation could not be used by Beijing to make historic claims to the South China Sea, parts of which are claimed by six governments. So, China LOST ‘2’ dot line in 1952 after abandoning Chinese claims under Chairman Mao Zedong in the Gulf of Tonkin in a moment of socialist bonhomie with Vietnam. Further then, the news said: On July 12, 2016, the ‘now nine-dash demarcation COULD NOT be used by BEIJING to make historic claims to the South China Sea because PARTS of China’s claims are ALSO claimed by SIX GOVERNMENTS. Our President Duterte said: Our soldiers will commit suicide [ to protect Pag-Asa] if taken by China! What about the OTHER territories in our EZZ zone? More suicides to that to come! On the Court’s announced judgment: Beijing reacted with outrage to the judgment, which delegitimized China’s maritime ambitions according to international law. Outrage! ? Confucius is SMILING! Not being a Communist, probably he is saying in his relic bones: I told you so. Let us wish then or hope that our PH State will invoke permanently our 200-mile-dot lines for good as ruled by the Permanent Arbitral Court and that China will take heed of Confucius words and not be confused with outrage instead. 谢谢 Xièxiè or Thank you Raissa Robles. I saw a video a few years of an interview to a British (or an American) journalist debunking the Chinese claim. In its hurry to put legitimacy to its claim, the Chinese government released a map with Chinese translations of the names of the islands, shoals, reefs, etc in the West Philippine Sea. One of them was a Chinese translation of a deer named to a shoal (or reef). They thought that the formation was named after the animal because of its shape. Little did they know that the land mass was named after the captain of the ship which had a shipwreck in 1900s in the land mass. Thus proving that the claim of China is just recent and was way after the Velarde Murillo map of 1700s which clearly shows Panatag Shoal being part of the Philippines. I just forgot about the exact details of this interview. Lebensraum . . . living space is ultimately China’s goal in the South China Sea which it claims belongs to China. Adolf Hitler tried to do this ideological policy in Europe and went over to the Soviet Union now Russia. China believes the territories in SCS are so rich in oil and natural gas. How to go about this policy needs control, occupation and administration to the exclusion of all other claimants in the area. Thus, the tension created. When Germany, Italy and Japan failed in lebensraum in WW II, China believes it will succeed. Through persistence and patience mixed with all ‘forms’ of strategies, the belief is there that China will be able to get this sea-space in SCS. What can other countries do about it including the Philippines? As it presently appear only the USA principally with support from allies is making head on counter-moves to China. China is now a power to reckon with militarily and economically, etc. Will China be contained to its borders at its shores at the mainland by freedom-loving nations as what resulted in WW II to the Axis powers? it has been shown in history that china was once at the height of power. for centuries chinese emperors lorded vast dominion, their influence and riches beyond comprehension of mortals, and yet lost all. western countries brought china to its knees and forced it to open its border to the world, in both trade and commerce. and what china is doing now is impoverishing poor countries. did what was done to her and with gusto! corruption in china is rife, pollution is rife and fresh air in china is rare commodity. the spaniards made a mistake calling pinas islas de las ladrones, island of thieves if my interpretation is correct. apparently the chinese has made stealing a very lucrative art form. not only copying and reproducing patented products, stealing borders na ang china, adding longitudes and latitudes to its confines. china these days is major de las ladrones. sorry, that’s the best of my highs chool spanish. know what is the talisman of thieves? coal, black as night. makes thieves blend with shadows kuno, therefore invisible and unnoticed. and there among us is one who is mega friends with thieves, marked siya at mukhang uling! his brothers keeper and has ordered the killing of many. STEALING. Thieves. PH clams have been stolen. Right inside ‘pinoys’ noses. Isinama pati yun mga kulangots<! Secretary Teddy ‘Boy’ Luk Sin says: No, that’s not true. We had no idea there were clams there and really I will not let this country go down to war or lose a useful economic partner just over environmental concerns for a world I care nothing about. I care only for my people and country. reverse it . . . it says: I care nothing about over [ PH’s world ] environmental concerns. context it. . . or lose a useful economy partner [ CHINA ]. . . just over PH CLAMS. Luk Sin will not dive to see those PH clams as they are not there anymore. What is he? SiNot Luk head of DFA. The PH oceans and seas are affairs of the Department part of ‘foreign’ items. Now, with this public statement, Luk Sin, Jr. of China will say: ‘Slip of my clam tongue’ yan. How about PH’s other environmental items like: honey? santol? Mangoes? FISH? or other marine edible products for PINOYS? Are these included in – ‘I CARE NOTHING about’ ? Then what does he care about as Secretary at DFA office? For sure. . . not PH CLAMS! * * * clamped up about STEALING and THIEVES of our PH sea assets. . . by Chinese. bwisit! remember the alamo, yan ang gusto ni locsin na battlecry, bigatin at hiram sa america, not remember erlinda, battle ng pinoys sa 2nd world war. may inferiority complex si locsin, meron tayong sariling war cry ayaw i-acknowledge. there is nothing wrong with having our own battle cry. and remember the clams is a good battle cry as any, uniquely pinoy and quirky. for locsin’s info, our being unique and quirky is what endears pinoy to the world, the equally unique and quirky designs of our designers are acknowledge, admired and copied the world over. at kung ikahihiya ni locsin ang humble clam battle cry, then he’s out of touch, he’s no longer a common tao but a common bao. sec of the farangs kasi yang si locsin. been sleeping on the job and did not know where the clams had gone. they’re just food, sabi ni locsin. again for his info, those clams represent more than just food. it took decades for clams to reach gigantic size and they can live up to hundred years. and for them to die in a few second it took to prise their shell open, is almost sacrilegious and criminal. and it is even more criminal for the chinese clam poachers to breach our territory, harvest giant clams and then sell much valued clam meat for high price. dried clam meat is ingredient of chinese medicine. the dead clams showed how ignorant locsin is! and no, locsin does not want to seen wearing scuba diving gears, his arms around a dead clam. the clam would look more decent than locsin and might even beat him sa social weather survey, he, he, he. and if confucius is alive today, he would not recognize china and would probly immigrate to estados unidos, he, he, he. and could well be working for president trump. Kung mag JET-SKI si Diggong papunta sa Panatag Iss., , para mag lagay ng plag ng ‘Pinas, dalawang flags ang i-lalagay: 2/3 parts CHINA FLAG at 1/3 Pinas flag. Sayang wala na si Mr. Joe Rosenthal, yun famoso na Iwo Jima flag photoexpert to take that flag raising of Diggong. digong might as well stick the flags in his eyes! he would have to gapang on all fours and kiss xi’s tikoy colored backside before being allowed to come within arm’s length of the chinese plagpole. his jet ski would need to have double plaka as well. there’s heavy traffic sa panatag, chinese junks are there ready to harang him. he would need lorenzana as signaler, locsin as navigator, bong go as steward. tight fit sa jet ski, trio of bayots pumalaot, he, he, he. ang palawan ang napag-initan, divided na into three na. one for china, one for palawenyos, and one for china again. yan baga ang land reform ni digong. in the meantime, todo dagsa ang mga bloke ng cocaine, palutang-lutang kuno sa dagat. the more kapolisan got blokes, the more blokes come. make me think tuloy new modus ito for kapolisan to get delivery of cocaine. yay! payday na naman.